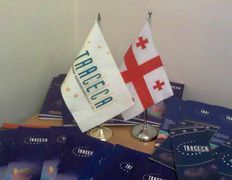 The meeting of Mr. Eduard Biriucov, Secretary General of the PS IGC TRACECA, Mr. Vatsadze, National Secretary of TRACECA in Georgia, and Mr. Tornike Gotsiridze, EU Senior Monitor in the Caucasus was devoted to discussing the on-going issues within the framework of the TRACECA corridor. At the meeting the Parties exchanged information concerning traffic, in particular, delivery patterns, transported freight nomenclature, existing barriers, and reached a common view on the necessity of tariff unification within the corridor. The Senior Monitor of the Regional Monitoring Office of Caucasus, Mr. Tornike Gotsiridze informed the Secretary General on the current activities of the Office within the framework of the EU Monitoring Programme in the neighbouring countries. On the outcomes of the meeting the Parties defined the main plans for joint activity regarding the implementation of the MLA basic provisions, Action Plan for the next year of 2011 and emphasized the priority issues of cooperation between the MLA TRACECA Parties.